Newer universities have come off worst in a carve-up of public money for research in Scotland. 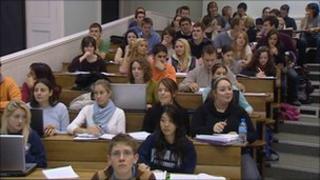 Some senior university figures are concerned it could herald the start of a divided higher education system. The Scottish Funding Council said it was being more generous to institutions with a record of research breakthroughs. All universities learned last month that they were facing a sizeable cut in their total spending. The Scottish Funding Council (SFC) has now published a grants letter which details colleges' and universities' share of an overall budget of £1.5bn in the 2011-12 academic year. It will allocate £528m to colleges and £956m to Scotland's Higher Education Institutions. The main teaching budget at all Scottish universities will be cut by 10.9% next year. Research funding and student support have been maintained at roughly the same level in cash terms as 2010-11. However, it has emerged that newer universities such as Queen Margaret in Edinburgh (-10.9%), Napier in Edinburgh (-6.6%) and the University of Abertay Dundee (-6.9%) are facing the largest cuts in their research budgets. Older institutions such as St Andrews University (-0.2%) and Aberdeen University (-0.5%) are seeing smaller cuts, and Edinburgh University (+0.4%) is enjoying a small rise in its research budget. The SFC has, however, given six newer universities more funding to help them teach students from disadvantaged backgrounds. Senior figures in the sector are concerned the funding pattern could mark the start of a two-tier education system with some concentrating on top-flight research and others on teaching. The Scottish Funding Council said it was channelling money to where it believed it would be used most effectively. SFC chief executive Mark Batho said: "Students will have the same opportunity to apply for a place at college or university for 2011/12 because existing student numbers are being maintained. "We have focused funding in key areas to encourage wider access to universities and colleges, and to support excellence in research, which is important to the economic development of Scotland." Universities Scotland, the organisation which works for the principals and directors of the country's universities, said the grant letter laid bare the magnitude of cuts facing institutions. Alastair Sim, the director of Universities Scotland, told BBC Radio Scotland's Good Morning Scotland programme: "We are seeing everyone facing a very serious cut in the amount of money for teaching, a cut of about 10.9% which is going to be extremely challenging for the year ahead and obviously an unsustainable situation beyond that. "I think what is important if you look across all Scotland's university, all of them have got real pockets of strength in research. There is no university that does not produce at least some absolute world class research. "Overall the message we are taking from this it is going to be an extremely challenging settlement trying to maintain existing student numbers on the basis of a reduced resource." Convener Prof Bernard King, of Abertay University, said the announcement had "surely put an end" to any suggestion that Scotland's universities did not already face a significant funding gap. He added: "This settlement will force universities to make a range of difficult decisions in 2011/12. "Put simply, this is not sustainable without real damage to universities. "This should serve as a wake-up call to all politicians of just how badly a long-term and sustainable funding solution for Scotland's universities is needed." The University and College Union (UCU) said the cut in higher education funding was much more severe than the overall cut in the Scottish budget. UCU Scottish official Mary Senior said: "The rest of the world is investing in higher education and we risk being left behind if we continue to wrongly think we can cut education." "The 11% cut in teaching funding will particularly impact on the quality of the education our students receive. "It is ludicrous to suggest an already stretched sector can do more for less. "The time has come to look at better and fairer ways to fund our universities."